The Raccoons “Run with us – we got everything you need!” Does that line from a certain theme song jog any memories for Canadians between the ages of about 20 to 40? What about Ralph, Melissa, Cedric? If not those names, then surely Bert or Cyril Sneer? The theme song, and the aforementioned characters, are from The Raccoons. This cartoon staring the eponymous anthropomorphized scavengers appeared on CBC for over a decade between 1980-91. This piece of Canadiana started as four specials, and then became a syndicated half-hour series. Cyril Sneer (an aardvark, by the way) was the corporate tree-cutting, money-grubbing villain who served as the foil to main protagonist, the bumbling but lovable Bert and the rest of his crew in Evergreen Forest (apparently somewhere in B.C.). The show clearly had an environmental activist edge, and that is why I’m writing about it right now. Along with Ryan O’Connor, another Active History blogger, I’m doing a little study of The Raccoons as emblematic of 1980s Canadian environmentalism. (As an aside, this project got off the ground because of the response to a partial jest on Twitter that we should study this subject). I’ll admit that a variety of other projects and events (such as the birth of our second child and getting a book manuscript off to the press) have been taking precedence, but over the last few I weeks I managed to watch half the specials and about a quarter of the episodes. Actually, tracking down copies of all the episodes has been tricky, and I have been viewing them through a combination of a trial subscription to Zip.ca and Library and Archives Canada (if anyone wants to lend or donate episodes, let me know!). In fact, there is probably another important story there – how is that all the episodes of a show with such resonance among my generation, a unique piece of Canadiana, are basically impossible to acquire? Only in Canada. There are some DVDs for sale, but they don’t have close to all the episodes. As part of the attempted clear cut, the tree in which the raccoons live is removed, and the human children of Ranger Dan (all phased out of the show soon after) unknowingly take it home as a Christmas tree. The raccoons attempt to retrieve it, becoming friends with Schaefer the dog in the process. They track the disappearing tree problem to a lumber mill, where they confront the Sneers, calling them “ecological disasters.” In response to Cyril’s pleas that he is not the only one lumbering, one of the raccoons states that there are many “responsible” lumberers: trees limits can be followed and trees replanted. These are just some examples of the themes and tone. 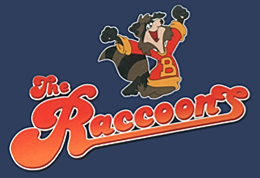 As The Raccoons transitioned into a syndicated series, the numbers of episodes with an overtly environmental theme started to decline, I think probably in large part because they were simply running out of environmental plot ideas. After all, 60 episodes were eventually produced. Nonetheless, there are episodes such as “Power Trip” where Cyril Sneer attempts to build his own hydro-electric power dam. Even when an outright environmental theme is dropped, the show takes a number of anti-corporate, anti-greed, and even anti-capitalist stances. On the other hand, the show arguably gives off a somewhat confused view of technology. While it is bad in the hands of the forest-cutting capitalists, technology (such as a portable video camera, or video games) that would have been cutting- edge at the time are prominently displayed, perhaps in an attempt to appeal to kids. Something else that I’ve picked up so far, but still need to verify through further research, is that animals foreign to Canada (e.g. aardvarks, rhino, crocodile) seem to be the bad guys. Maybe it is just coincidence, or maybe there is something more there. In addition to watching the shows, we hope to interview the creator, Kevin Gillis. It turns out Gillis is from the Ottawa area and has a cabin in eastern Ontario. But it gets better. Through two passing remarks about the show in the span of about a week, I learned that my Dad had dated Kevin Gillis’s sister many years back, and that one of his neighbours currently works for him. We’ve put out feelers, and we hope to interview him in the near future. We also want to find some information about influence and viewership – maybe that will take the form of Neilson ratings or other means of assessing viewership. In the meantime, the amount of enthusiastic responses when people find out what we’re doing strongly suggests, if only anecdotally, that the show had an impact. But why talk about all this? I think The Raccoons is first-off a historical “document.” Viewing The Raccoons gives us some idea of what the environmental discourse was like in popular culture in a certain time period, especially if things like viewership, influence, and causality can be established. It also shows the power of the medium to influence opinion – indeed, a kids cartoon probably has a played a bigger role in shaping attitudes than what environmentalists and academics wrote about the subject. And, of course, we get to relive childhood memories while watching cartoons and call it “research”! Daniel Macfarlane is a SSHRC postdoctoral fellow at Carleton University and for 2012-13 the Fulbright Visiting Research Chair in Canadian Studies at St. Lawrence University and Michigan State University. He is working on several projects related to Canadian-American water history, including a forthcoming book on the St. Lawrence Seaway and Power Project. I happened to come across the Raccoons in a slightly different research context – leading a great Canadian kazoo band playing the national anthem for Canada Day – an image can be found here: http://pamplemoose.blogspot.ca/2011/06/canada-day-144.html . I wish you luck with this project, and you raise a really important issue around conservation of video materials. As a grad student, perhaps inspired by a similar impulse that underpinned your project, I tried to work on a project about Canadian children’s television. My initial plan was to look at images/ideas about Canada from “Cucumber Club” – about the “Children’s Underground Club of United Moose and Beaver for Enthusiastic Reporters”, which aired on TVOntario in the early 80s. However, my investigations turned up the fact that TVOntario had trashed all the tapes – it was too expensive to maintain them. I ended up working on another TVOntario show, “Today’s Special”, which had survived because of syndication, but discovered even there that many of the episodes had not been preserved. The cost of maintaining the old format videos was seen as too prohibitive for shows that were no longer airing. I hope you have more luck with The Raccoons! In terms of other related sources about production and viewership, at least for the 1960s and 1970s, the national archives has pretty good files from the CBC for a number of individual shows and programs. Those for the Raccoons may still be at the CBC, but it’s worth checking out. Best of luck tracking down the rest of the episodes and with the project. I had a twitter conversation with a fellow (@jarlofyork – perhaps you might want to chat with him) who wanted to write about the show as a commentary on US/Canada relations in the NAFTA era but couldn’t get access to the episodes. As a proud member of the Cucumber Club and avid fan to Today’s Special it makes me really sad to hear about the TVO tapes being destroyed. They may not have been valued by the company but they are certainly significant to those of us who watched them. Like so many readers, I had a similar nostalgic reaction to your post! The preservation issues also raise an issue that nags me: that so much of our audio-visual heritage is lost through these issues of space retention, ignorance, etc. This all has the effect of leaving historians with text. It might be our preferred medium to work with, but if we’re doing post-1960 history it also means we’re not engaging with the media of the times. All of this is to say that this sort of research is critically important, both for what you find and for its methodological implications! A great post and an interesting project, Dan. It strikes me as interesting that these racoons in the show are non-urban animals that live in forests, since most Canadians probably more often see racoons that scavenge in cities. Racoons are quite prominent in Toronto. Porter Airline’s mascot is a cosmopolitan raccoon, @City_Raccoon (deceased, apparently) and @TorontoRaccoon tweeted from the perspective of this city-dwelling animal, and there have even been calls to make the animal the city’s official mascot. So there might be some interesting rural-urban dynamics at play here, since the animal resides in both environments. Good luck with your research! Fascinating post. Really interesting perspective. This brought back so many memories! Would love to hear more about what you find! Also, let us know if we can help in any way. Perhaps CBC Archives can add some insight? Thanks for the comments everyone, and I appreciate the support! I tried looking at CBC’s website and archives but couldn’t find anything – but if anyone knows if CBC has episodes, and works at CBC or knows someone who does, I would be very interested in getting access (maybe even just within the CBC studio in Ottawa if they don’t want the copies to leave the premises). I managed to wrangle all the episodes (albeit through the questionable legality of a torrent, though it’s hard to say how illegal if you can’t get it through legitimate means). I loved the show as a child and wanted my oldest (now 5) to experience it. It’s still wholesome, and many of the environmental themes remain prominent. The episode “Read no Evil” from season 2, for example, deals with property rights, oil resource development, wetland protection and illiteracy. Fun for the whole family!